The eclipse on August 21 brought in a new octave of consciousness and a new experience in which things have been shaken up and extreme, especially the weather with floods and fires and earthquakes and solar storms which continue. The eclipse was a nexus point and a harbinger change, a coming into seeing the shadows. After that, there was a time of inner quiet and processing, of going within until in which Mercury was retrograde and then started moving forward on September 5. Retrograde- in astrology means that is a time to revisit, review from the within. I found myself feeling intense emotions and moving through them with forgiveness work, of self and others which rippled out from the quantum inner level and was reflected in friendships with others pretty quickly. We have so much power to change our inner world, to more calm and peace and see it reflected outside of us. That being said, it may be a time of great challenge to be the calm within the outer storms. It is a matter of not getting hooked on what is happening and to keep going inside, or so I am learning as an eternal student. What do you wish to say about the energetic space many are experiencing this month? As infinite intelligence, we represent the higher selves as a collective of knowing of the souls as one oversoul on planet earth. See, in your mind’s eye, a golden quantum field of knowing, represented by a symbol which represents love in the form of knowledge. 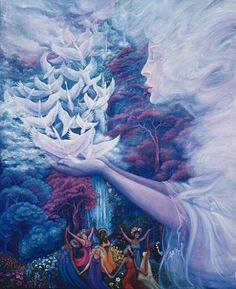 All souls wish to be immersed in this infinite field of love, which is who they truly are. They/We want to bring this to earth and have chosen to do so; they want to graduate from cycles of suffering. The symbol mentioned is your personal symbol, a key to access this golden field of love. The cycles of suffering represent personal and collective karma of cause and effect played out over aeons. And we assure you, speaking for all of you from you that your higher selves are united and collectivy choosing to shift. Do you feel the intensity, the changes within your being? Do not take this personally. See it with neutrality as the waves of change shift all life including each one of you. Do you not see the signs of change? The signs which include so many people that are leaving the planet? 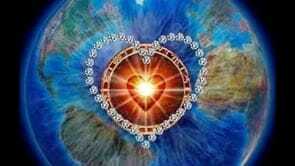 Do you notice the signs of the intensity are becoming greater as greater light is embodied within all life? Your biological anatomy, your physiology is being affected greatly. Your lives and selves are becoming different on all levels: emotional, physical, mental and spiritual. Remember where you came from, before this body. You have existed and will always exist, in other forms beyond this lifetime as an eternal being. This is a mere blip in the history of time, in the history of the universe. You have always been loved and supported. You brought your heart flame to this planet in this beautiful body that you inhabit. Remember that the universe is sentient and alive. Remember that this is an ascension process in which looks messy and chaotic and even violent, yet it is a time in which great shift is happening. Everyday more light is anchored from your being which enters the earth. 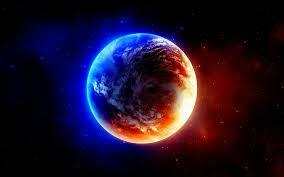 Light that you receive goes on the surface of earth as an exchange to all beings. Pray for peace and cultivate your own inner peace, the still place in the center. Be with people who make you feel peaceful too. The light you are is a gift. Your memories of home, your skills, all that you remember is a gift to the collective. Keep the memories of where you came from, the before time, alive in your heart but not as a story or as data. Keep them alive as a feeling. Discover that feeling inside you and transmit that feeling to remind your friends, perhaps those who are in resonance of Lemuria, of the star planets of Sirius, Pleiades, Andromeda and other planets of origin or remembrance. Remind them of magic. Remind your friends in resonance of the feeling of joy that the dolphins bring. remind them of the higher dimensional feeling, the fifth dimensional feeling that you have inside when you are connected to source. Go there, open your crown and receive in vision, and let it illumine your being. In tapping into what the coming Equinox gateway will bring to the us, I received a feeling of joy and excitement, visions and information. Woo hoo! We are ever expanding and evolving as a species. Are you feeling the intensity of it? Let me share what I am seeing and feeling as an akashic reader listening to cosmic information in a download. Please use your own guidance to know what the Equinox will be for yourself. Vision: Seeing the cosmic whales connected to the stars, connected to the earths oceans and everyone of you. Cosmic whales represent and embody the oversoul or group soul. Physical Earth whales are the frequency keepers of earth and those who have the records, or some believe. There is a connection between cosmic whales and Earth whales as the Cosmic Whales are the higher selves of the whales, just as we humans have higher selves. Tap into the frequency or the feeling of the whales, as they are so joyful and loving. Also imagine the cosmic whales swimming through space, and feel them. There is something very special about whales.